Assam Rajiv Gandhi University of Cooperative Management, Sivasagar. 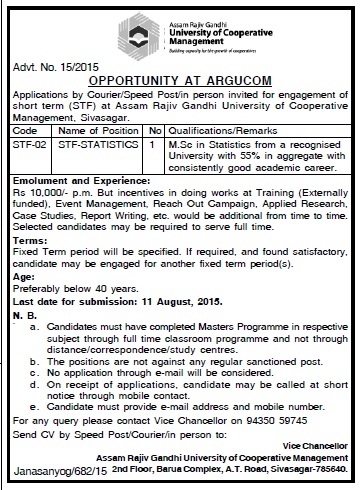 Applications by courier/ speed post/ in person are invited for engagement of Short Term (STF) at Assam Rajiv Gandhi University of Cooperative Management, Sivasagar. Educational Qualification: MSc in Statistics with 55% from a recognised university with 55% in aggregate with consistently good academic career.